Any recommendations for a good degreaser fluid? What do you use in your workshop? I used to use paraffin, but it is so expensive now that it is actually cheaper to use petrol. Someone told me they paid £9-90 for 4 litres of paraffin at the local MOLE country store the other day!!! I need to look into a bulk supply of red diesel, and I am going to make inquiries about bulk paraffin as well. Very little difference between paraffin, kerosene and 28 sec heating oil at 30p a litre! 4 litres of paraffin @£9.90 a pop is £2.47 a litre, ie twice the price of petrol. Idea on really ditched paintwork, spray on, leave 5 minutes and wipe off. You have to see the result to believe it. WÜrth brake cleaner and AutoSmart TFR are my chemicals of choice . depends what I am cleaning and why. For cleaning to "araldite together" or Loctite , I use either cellulose thinners or Hammerite thinners. Brake cleaner should work well, never tried it on anything but the car but thanks for the idea. White spirit will shift thick muck but I always use thinners afterwards to finalize the cleaning. WD40 is fine but the copies GT85 are cheaper and work. IPA (isopropyl alcohol is also good for some things ( cleaning cassette tape heads /video heads in times gone by. If you want this buy from amazon as a damn sight cheaper than I can get it ( pharmacist by trade) and it's delivered. Never tried petrol but now it's lead free might give it a go. Have used paraffin but takes a while to evaporate off and I usually don't have the patience, not sure on price per litre currently. Diesel is very good for keeping midges away, better than the bought lotions. To old to worry about girls. Cheapest way for real dirty stuff, if you don't have a steam cleaner, is hot water and washing powder, boil if possible. Best for "chemical" clean is cell. thinners. Washing powder can be very good although it can cause pitting in metals, very good at cleaning teapots internally with an over night soak. When in search of John’s Elbow Grease, having visited 3 of the correct type of store to no avail began to wonder if it was a wind up. Eventually found it in Pound Stretcher. No not a wind up in fact just been round the workshop to find a dirty bit of machine. 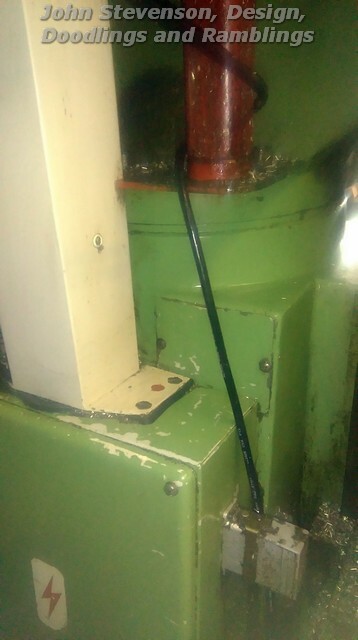 Backside of a Beaver milling machine, not been cleaned in at least 15 years. Spray on, leave 5 minutes and wipe off. Sugar Soap, as used in paintwork preparation, works similarly, and B&Q (spit) sell it in spray bottles but cheaper to mix your own from the crystals. A clock repair book recomended Amonia and washing powder mixed with hot water , it worked but after rincing the steel parts rusted almost instantly . If its assembled parts and cat be arsed to take apart, brake cleaner or carb cleaner. Removable machined aluminium items soap and water then washed off and dried. Cant get trike any more. The washing powder works well on steels with decades of grime, hardened oil and the like. We used to boil actions and locks in a saucepan, comes out shiny no pitting on non replaceable items or face £13k making to the in the white stage. Almost out of engine cleaner and don't fancy replacing now at around £18/gallon. Used to use Muck Off get it cheap but was shown a couple of years ago by nipper just how good that Elbow Grease works. Don't bother with the fancy aluminium wheel cleaners, spray Elbow Grease on leave for a few minutes, brush over then rinse off. First time tried it removed 8 years of brake dust embedded no other cleaners or muscle removed. So sent nipper out and bought a box. Seems' "Elbow Grease" is a UK product. Not heard of it down here in the colony of OZ so wondering if anyone can let me know the active ingredients if known. Perhaps I can find a similar product down here? I will meanwhile see if the manufacturer's web site gives a clue to whether it is available here. Curiosity got the better of me and I Googled. Apparently, it has other uses. Say no more, wink, wink or is my spelling wrong? 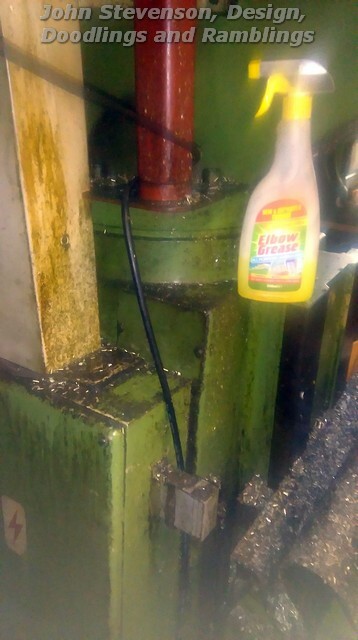 I'd say that Elbow Grease is just a generic citric acid cleaner judging by the smell. In Australia, 'Jiff' liquid does a great job. It even cleans cast iron surfaces like new. It is great for paint preparation as well, because it seems to remove all traces of hydrocarbon, rather than just diluting them like solvents do.